VANCOUVER, Jan. 16, 2019 /CNW/ - Leagold Mining Corporation (TSX:LMC; OTCQX:LMCNF) (Leagold or the Company) reports that a Feasibility Study (Expansion Feasibility Study) prepared by independent consultants for the expansion of the Company's Los Filos mine in Mexico is now complete. 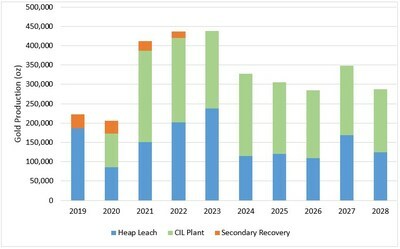 The Expansion Feasibility Study incorporates the potential for: development of the Bermejal underground mine, enlarging the Los Filos open pit mine, re-phasing of the Bermejal open pit into two distinct open pits (Bermejal and Guadalupe), and the construction of a carbon-in-leach (CIL) processing facility to complement the existing heap leach facilities. Leagold CEO Neil Woodyer commented: "When we acquired Los Filos in April 2017 from Goldcorp, we identified its potential to be developed into a long life, low-cost operation with significant scale. During the 20 months since the acquisition, we have carried out extensive exploration programs for both open pit and underground deposits, developed a 1,330-metre ramp to access the ore body at Bermejal underground, completed the Bermejal underground mine design, completed comprehensive metallurgical test work on all of the mineral deposits to support the CIL plant design, and learned a lot from current operations. Our investment in this work to date is approximately $30 million and forms the basis of the independent Feasibility Study and a 43‑101 technical report. 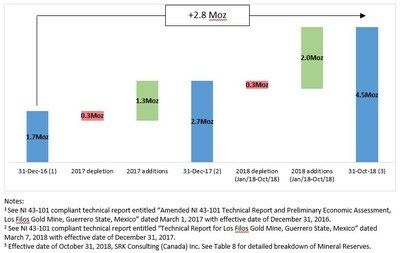 tonnes at 1.44 grams per tonne containing 3.457 Moz gold (effective date of October 31, 2018, SRK Consulting (Canada) Inc.). "The study forecasts a 10-year mine life with annual gold production approximately doubling from current rates. The Los Filos mineral reserves have increased to 4.5 Moz2, from 1.7 Moz3 at the acquisition in 2017. Los Filos also has abundant mineral resources that provide additional opportunities for adding to the increased reserves and further extending the mine life. We intend to carryout additional exploration programs designed to extend mine life. "The study identifies a new operating strategy which includes three large open pits, two high-grade underground mines, the addition of a CIL plant to process the higher-grade ore, and the continued heap leaching of the lower-grade open pit ore. The Los Filos expansion will also benefit from existing operations and excellent infrastructure. Approximately 51% of the gold production in the life of mine plan is from the CIL plant and 49% is from the existing heap leach facility. "With this very positive study completed, we are now putting its findings into our overall corporate business model for planning and corporate financing purposes. It is obviously a project we should undertake and therefore we are preparing a Los Filos development plan that includes construction planning, optimizing the sequencing of the major expansion projects, and recognizing the social and economic benefits created by the expansion opportunities and the engagement required from employees, contractors, unions and community members. "The Los Filos acquisition and this expansion plan illustrate the benefits and success of our buy and build strategy." The Bermejal underground mine utilizes the existing 1,330-metre exploration ramp as its main access ramp and includes an additional 11 km of development. The 15-month pre-commercial development period and the Expansion Feasibility Study assumes this commences in Q2 2019 and extends to Q3 2020 when the production rate sustains 1,100 tpd. Ore produced prior to start‑up of the CIL plant will be sent to the heap leach facility. 3 Mineral Reserves are quoted using a NSR break-even cut-off grade approach with minimum block NSR of $149.4/t for Bermejal underground. Cut-off grade for the Los Filos underground is 2.59 g/t. Mineral reserves for Los Filos, Bermejal and Guadalupe open pits are based on variable break-even cut-offs for ore revenue as generated by process destination and recoveries. Variables for revenue calculation include process cost, recovery, and estimated gold, copper and sulphur grades. A technical report for the Expanded Feasibility Study, prepared in accordance with National Instrument 43-101 – Standards of Disclosure for Mineral Projects (NI 43-101), will be filed under Leagold's profile on SEDAR at www.sedar.com within 45 days of the date of this news release. The mineral resources and mineral reserves reported within the Expansion Feasibility Study were prepared in accordance with standards as defined by the Canadian Institute of Mining, Metallurgy and Petroleum ("CIM") CIM Definition Standards on Mineral Resources and Mineral Reserves, adopted by CIM Council on May 10, 2014. The technical information contained in the Expanded Feasibility Study was prepared by and, or, reviewed and approved by the following independent "Qualified Persons" as defined by NI 43-101, and they have reviewed and approved the contents of this news release. The Qualified Persons have also verified the data included in the news release. This news release has been reviewed on behalf of Leagold by Doug Reddy, Leagold's Senior Vice President, Technical Services, a "Qualified Person" as defined by NI 43-101. This news release contains "forward looking information" or "forward looking statements" within the meaning of applicable securities legislation. Forward-looking information and forward looking statements include, but are not limited to, statements with respect to the results of the Expansion Feasibility Study, anticipated production, reserves, , expected AISC and cash costs, potential for development at the Bermejal underground mine, enlarging the Los Filos open pit mine, re-phasing of the Bermejal open pit into two distinct open pits (Bermejal and Guadalupe) and the construction of a carbon-in-leach processing facility. Generally, these forward looking information and forward looking statements can be identified by the use of forward looking terminology such as "plans", "expects" or "does not expect", "is expected", "budget", "scheduled", "estimates", "forecasts", "intends", "anticipates" or "does not anticipate", "will continue" or "believes", or variations of such words and phrases or state that certain actions, events or results "may", "could", "would", "might" or "will be taken", "occur" or "be achieved". Statements concerning mineral resource estimates may also be deemed to constitute forward looking information to the extent that they involve estimates of the mineralization that will be encountered. The material factors or assumptions used to develop forward looking information or statements are disclosed throughout this document. This news release refers to expected AISC per ounce which is a non-GAAP (generally accepted accounting principles) measure however is a measure the Company believes more fully-defines the total costs associated with producing gold. 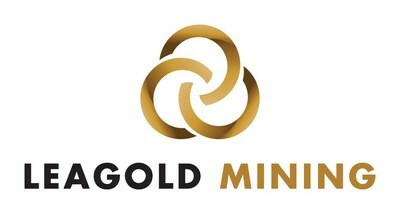 This measurement has no standardized meaning under International Financial Reporting Standards (IFRS) accordingly there may be some variation in method of computation of "all-in sustaining costs" as determined by the Company compared with other mining companies. AISC reported by Leagold includes mine cash costs, land access payments, royalties, and sustaining capital expenditures, but excludes non-sustaining capitalized stripping and end of life reclamation costs. 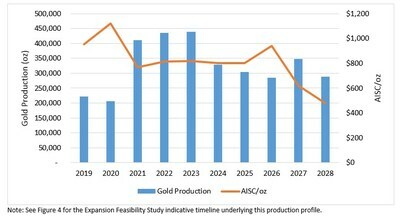 The LOM AISC of $795/oz increases to $811/oz if end of mine life reclamation costs are included in accordance with the World Gold Council guidance on AISC. This news release refers to expected total cash costs which are a common financial performance measure in the gold mining industry however it has no standard meaning under IFRS. The Company reports total cash costs on a per ounce sold basis. The Company believes that, in addition to conventional measures prepared in accordance with IFRS such as costs of sales, certain investors use this information to evaluate the Company's performance and ability to generate operating income and cash flow from its mining operations. Management uses this metric as an important tool to monitor operating costs. Adoption of the standard is voluntary and other companies may quantify this measure differently because of different underlying principles and policies applied.